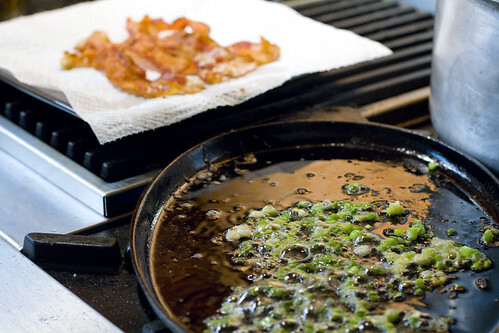 The extra steps are just frying up some bacon, and then frying some scallions in the bacon grease. You can do that blind-folded. Ok, maybe you should peek, but how about with one eye closed? The rest is still dump and stir. See, it really is that easy. 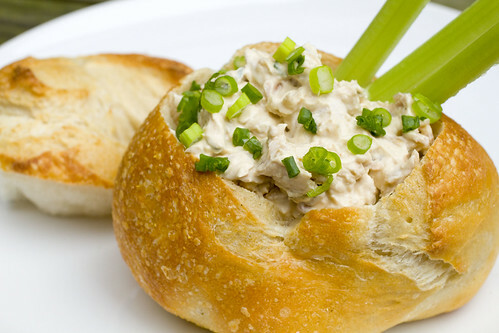 The dip is creamy and chunky, loaded with flavor, and versatile. If you want to be healthy-ish, serve it with celery. If you want it to be more filling, serve it with crusty sourdough bread. If you more fat (because sometimes you just do), have it with thick-cut chips. You can also serve it with all three and make everyone happy. 1. Cook bacon as you normally would and remove to paper towel when they are crispy and golden. 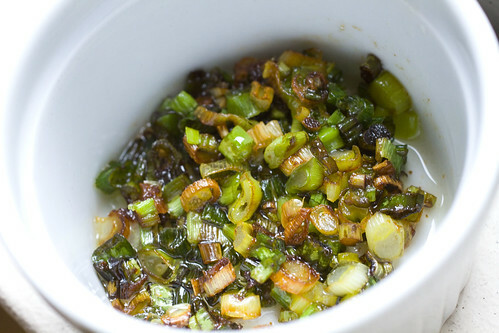 Fry 1/4 cup chopped scallions (should be on low flame) in the bacon grease for a few seconds. 2. Remove scallions to a bowl and set aside to cool. Crumble bacon once it has cooled. 3. 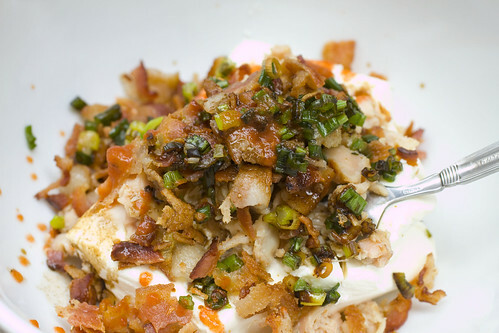 In a large bowl, mix cream cheese, crumbled bacon, cooled scallions, clams (without liquid), Worcestershire, and hot sauce. Stir in 1 to 2 tablespoons reserved clam juice to get to desired consistency. 4. Cover and refrigerate until serving. (Can be made up to one day ahead.) Reserve and refrigerate some clam juice also in case you need to loosen before serving. 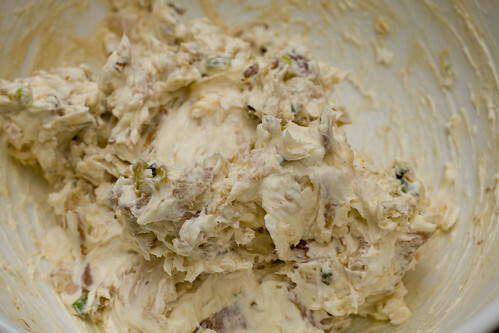 Garnish with chopped scallion (if desired) and serve with celery and/or thick-cut chips and/or sourdough bread. 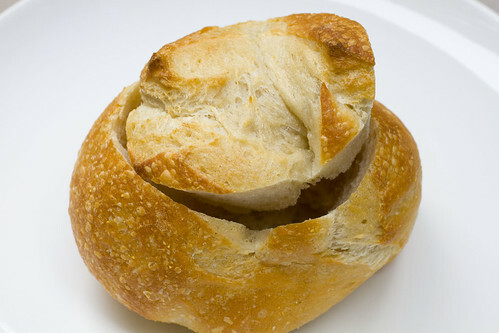 If you want to serve it in a bread bowl, just cut a circle in the center and pull out the insides. 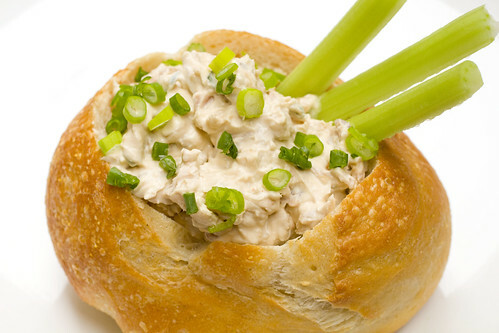 Fill the bread bowl with dip. posted by jessica	at 03:10 PM	Filed under American, Recipes. You can follow any responses to this entry through the RSS 2.0 feed. Both comments and pings are currently closed. What a tasty sounding dip. I love the combo of delicious flavors. Perfect perfect for superbowl!!!! I am all about the dips. And bread bowls. In fact, this probably wouldn’t make it to a superbowl party. I would have eaten it almost immediately upon making it. I will make this Sunday! YUM!! Thanks everyone! Don’t forget to send me pictures! Love it! 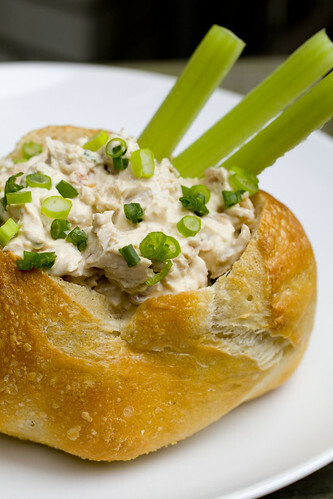 Baz makes this stuffed with mussels in white wine & scallions. I’m going to do yours this weekend for our son & daughter-in-law! Thanks Jessica! I love the presentation! That looks so appetizing! Lesley, I’ve never had a mussel dip. Jessica, your presentation is beyond amazing! I never though of presenting dips this way. I gotta try this without the bacon (I don’t eat pork/poultry/beef).